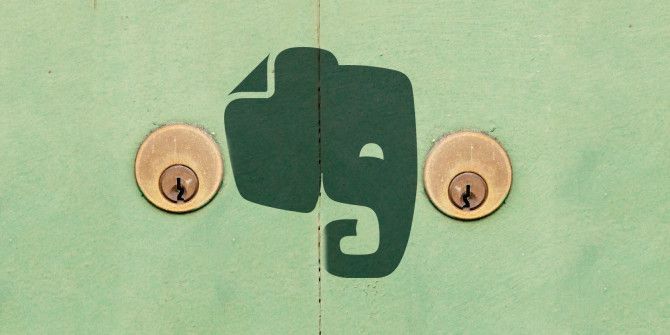 Evernote has just extended their Two-Step Verification program to all users to ensure account holders can improve their security. Two-Step Verification is one very effective way you can protect your online accounts (it’s also called Two-Factor Authentication What Is Two-Factor Authentication, And Why You Should Use It What Is Two-Factor Authentication, And Why You Should Use It Two-factor authentication (2FA) is a security method that requires two different ways of proving your identity. It is commonly used in everyday life. For example paying with a credit card not only requires the card,... Read More ). It’s a little annoying to implement, but it’s worth it for the peace of mind that it brings. Not all web services offer Two-Step Verification. But some of the big companies do Which Services Offer Two-Factor Authentication? Which Services Offer Two-Factor Authentication? Not long ago, Tina told you all about two-factor authentication, how it works, and why you should use it. In a nutshell, two-factor authentication (2FA), or two-step verification as it’s sometimes called, is an additional... Read More – Google Google Recommends 2-Step Process To Protect Your Account [News] Google Recommends 2-Step Process To Protect Your Account [News] Most savvy Internet users probably have at one at least Google account - mainly because Google, for good or bad, crosses paths with so many other websites that it's hard to avoid not using the... Read More , Apple, Lastpass, WordPress, Dropbox, and Evernote. Evernote actually introduced the two-step verification feature several months ago, and it’s only now being rolled out to all users. I highly recommend you take advantage of the free security feature and switch it on. All you need (apart from your Evernote account, obviously), is your mobile phone. You can start the process by going here. Premium Evernote account holders have the option of receiving their codes via SMS text message, but free account holders have to use Google Authenticator [iTunes link [No Longer Available] | Android link] (which means that your phone needs to be a smartphone). Once your phone number has been verified, and Google Authenticator is installed (if applicable), then collect your backup codes from the page. These are emergency codes in case for some reason the Google Authenticator app doesn’t work, or the text messages don’t arrive, or you’ve simply forgotten your phone – just don’t leave them in your Evernote acc0unt! For best results, print them out and keep them somewhere safe. Explore more about: Evernote, Online Security, Two-Factor Authentication.